In this experiment, the bacteria E. coli JM 101, which is sensitive to ampicillin and incapable of producing beta-galactosidase needed for lactose breakdown, is transformed by insertion of the pUC8 plasmid, receiving antibiotic resistance as well as the lac+ phenotype. In two 45-minute lab sessions, the traits are transferred, and the transformed cells are grown on agar plates containing the antibiotic and on plates with ampicillin and x-gal, a histochemical substrate for β; -galactosidase that yields a blue precipitate upon hydrolysis. 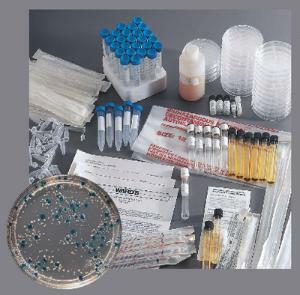 Transformants appear as white colonies on plates with ampicillin and blue colonies on plates with ampicillin and x-gal. It comes with enough materials for five setups, as well as a teacher’s guide and student copymaster.